If you think of local bands who dressed to shock and amuse, the first band that comes to mind is probably Split Enz. Yet, their odd outfits created by Noel Crombie weren’t the first or the last time a local band would dress to get a reaction. Let’s put them to one side and take a look at other costumes that local bands have put on over the year – everything from the stylish to the downright ridiculous. It might be seem surprising to start with this band, who look like your standard country band from any era. However back in the late 1940s when The Tumbleweeds got started, it wasn’t just a case of going down to your local costume store to get a cowboy hat and boots. Instead, every item of their clothing had to be made by hand. The full documentary on The Tumbleweeds is below (NZ On Screen). The sixties was an era of bands in matching outfits. For example, take the regimental uniforms worn by Larry’s Rebels or the cloak jackets worn by The Simple Image. 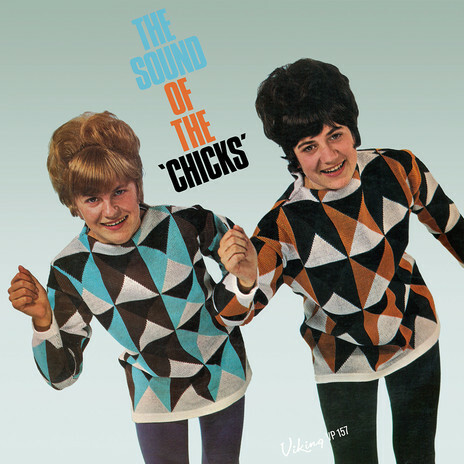 Yet the most iconic clothes of the era were undoubtedly those worn by pop duo, The Chicks. This was highlighted in 2017 when two of their most striking outfits were displayed in the Volume exhibition at Auckland Museum. One of the display pieces was a satin romper (an all-in-one shirt and hot pants combo), while the other was the pair of triangle-patterned woollen jumpers that they called their “Chick jumpers”. Their clothes were often chosen by their manager, Ron Dalton, who also insisted on them getting mod haircuts (they started out with a heavily-lacquered beehive style). Their look was completed with tall go-go boots and shiny leggings. A couple of years after forming, the pair became mainstays on TV show C’mon, and in the video below from NZ On Screen you’ll see them performing in matching sparkly jumpsuits. 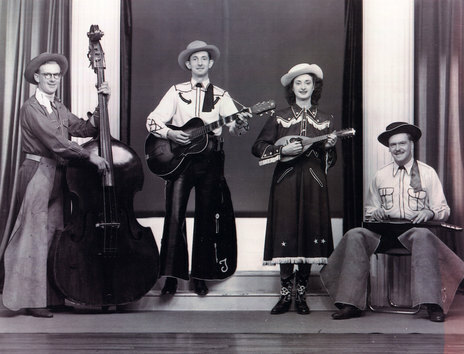 The concept of a “jug band” usually revolves around any attempt to create fun music with whatever lays to hand, whether it was the African-Americans playing homemade instruments in the 1920s, English teenagers creating skiffle with washboard rhythm sections in the 1950s, or the hippie era of back-to-basics folk (which is how the Grateful Dead got started). In the early 1970s, New Zealand got its own version with the arrival of Hogsnort Rupert and the Bulldogs Allstar Goodtime Band. The latter saw they could create a great live show if they took this upbeat, fun style of music and combined it with an outrageous dress sense. 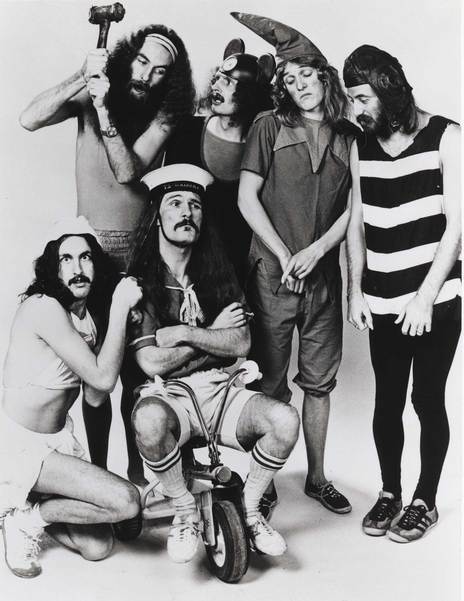 Each member ended up playing a separate character within the band: Kevin Collings (bee), Peter Dickson (baby), Denis Gibbins (mouse), Craig Johnston (sailor), Marcel Rodeka (pixie) and Steve Young (ballerina). Their novelty song, ‘Baked Beans,’ hit the Top 40 on both sides of the Tasman and they became a popular live act. Yet it took a while before their efforts as songwriters were properly recognised – Steve Young at last received a Silver Scroll award in 1983 for a song he wrote for the band, ‘I Can’t Sing Very Well.’ Though it’s ‘Baked Beans’ that the band will no doubt be remembered for. The Plague were a band born out of the punk ethos of the time, but with more of an artistic bent (lead singer, Richard von Sturmer, was already a published poet). Their music was nihilistic and confrontational, so their stage show had to match. 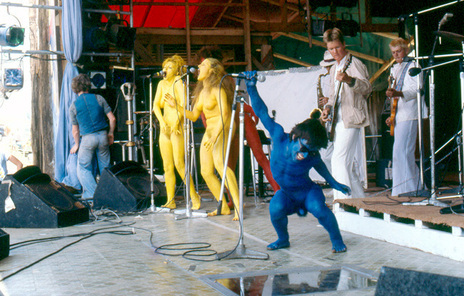 Most memorable was the time the band took the stage at the Nambassa festival in 1979 with four members dressed only in a thick coat of paint. Don McGlashan also passed through the band (usually dressed as a penguin onstage) and von Sturmer went on to pen the lyrics for him, including the Blam Blam Blam hit, “There Is No Depression In New Zealand.” It’s an amazing mind that could come up with those words and also take the stage in front of thousands in only blue paint and a pair of sunglasses. A mix of art-school thinking and punk attitude inspired the outfits worn by new wave group, Suburban Reptiles. 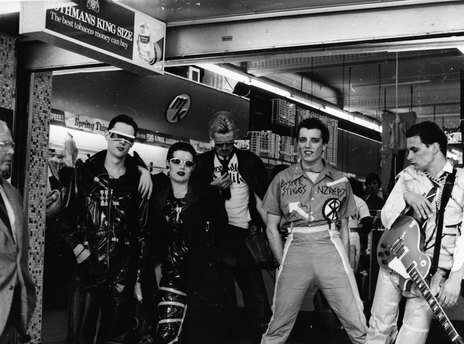 Lead singer Zero and saxophonist Jimmy Joy were both to be seen wearing homemade plastic outfits with futuristic sunglasses, while drummer Buster Stiggs used patches and permanent marker to create his own unique jumpsuit. Yet, in retrospect, the most surprising look was probably the Nazi chic image (peroxide blonde hair, black jacket and small moustache) of bassist Bones Hillman, given that he’d later find fame as a member of the left-leaning, politically-motivated band, Midnight Oil. To get an impression of the band looked like as a live act, it’s worth checking out the video for ‘Megaton’, though unfortunately the only version available online is reasonably poor quality. There’s a bit of an overlap with the next act since all three original members were also in Suburban Reptiles at various times: Phil Judd, Bones Hillman and Buster Stiggs. 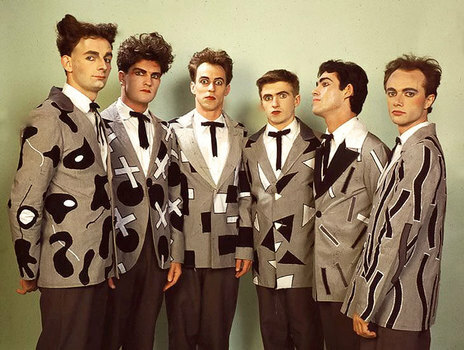 Judd was also in early Split Enz so it’s not surprising he’d be amenable to the band taking a shared costume. In fact punk and new wave inspired a range of bands to dress in synch, from the Beagle Boys cartoon jumpers of Proud Scum to the more stylised outfits of Electrabeat and the Techtones. The Swingers outdid the others by having matching shirts made with the New Zealand flag emblazoned across the chest (said to be inspired by the ride gear worn by legendary New Zealand motorcyclist, Ivan Mauger). 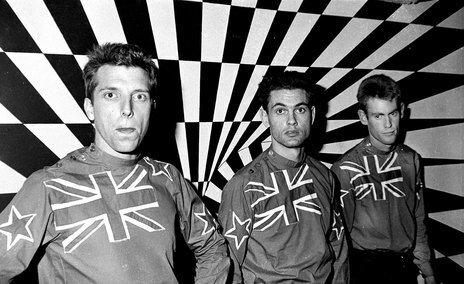 The outfits also looked striking in the band’s first video, in which the blue of the flag disappears against the bluescreen leaving only the Union Jack and stars on each arm. In the nineties, streetwear became the norm (following trends in grunge, hip hop, and nu-metal), and dressing up came to be seen as pretentious. Yet things had gradually changed by the new millennium and Wellington group So So Modern came out with a band look that paired well with their musical approach of mixing of new-wave-synths and math-rock. 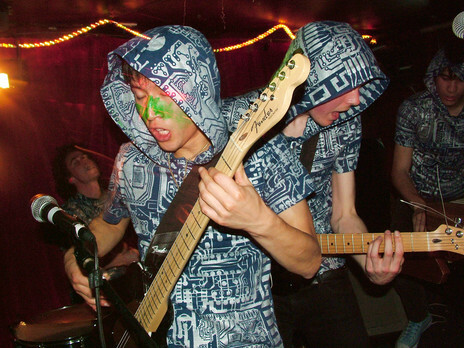 During their first years as a band, they appeared in various custom-made ensembles with matching hoodies and pants, for example this one with a switchboard pattern. These outfits had the effect of presenting the audience with a futuristic looking band who seemed to have beamed back to the present with some eccentric new form of music. You can see the band’s various looks on show in the video below (made from live footage by Ian Jorgensen). 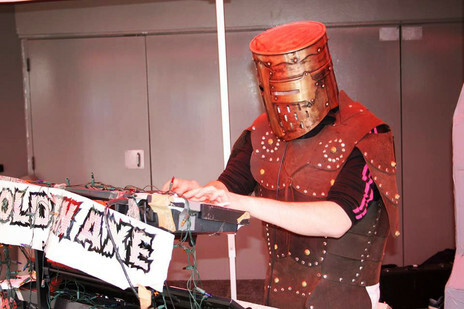 Golden Axe made music that was similarly frenetic and their look matched their sound – wild wigs and face masks that doubled as mic-holders. 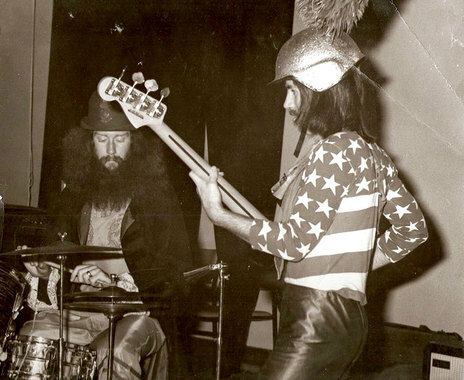 As new opportunities arose, they pushed the dress-up element of their live show, as can be seen in this image of them playing at a pop culture and comic convention. This noisy video from Camp A Low Hum probably best captures the way the duo would play unusual spaces, dressed in their own distinct style (in this case, shiny long robes). The music of Zowie (aka Zoe Fleury) might seem a world away from the previous two artists I’ve mentioned, but in fact she started out playing in a similar scene – her first band, Bengal Lights, played an A Low Hum tour (as did both So So Modern and Golden Axe). However, when she started a solo project, she took obvious inspiration from David Bowie in her attempt to take the imagery of sci-fi into the world of pop music. She had clothes designed specifically to further this idea – tight rigid outfits with jutting soft-spikes and outsized shoulder pads, all of which would be further exaggerated in her promotional shots. Her hair was cut in a rigid line across the front that gave her the same slightly-alien look that Bowie had achieved by shaving off his eyebrows. The music video for Zowie’s Top 10 single ‘Broken Machine’ captures an array of her outfits and gives a great sense of her ability to meld image and musical creativity.